This section of Beaverton-Hillsdale Highway is one of four locations that will be monitored by fixed photo radar cameras beginning this summer. Portland’s fight against the epidemic of speeding on our streets is about to get real. Beginning August 1st of this year the city’s first unmanned fixed photo radar cameras will go into operation. The new cameras will be installed by Xerox Corporation at four locations as per an ordinance adopted by Portland City Council yesterday (PDF). 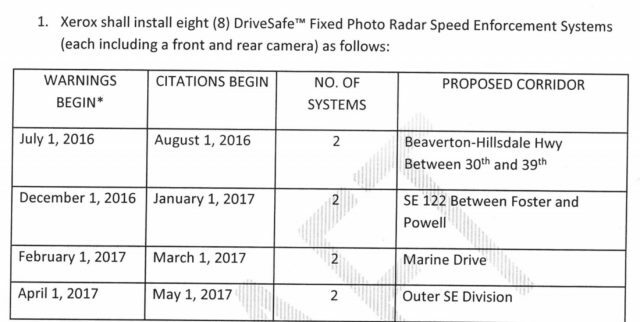 The ordinance calls for two cameras (facing each direction) that will be in operation 24 hours a day seven days a week at each location: Beaverton-Hillsdale Highway between 30th and 39th, SE 122nd between Foster and Powell, Marine Drive, and outer SE Division. The Portland Bureau of Transportation (PBOT) is focused on these locations because they are all on a list of “high crash corridors” that have a history of fatal crashes that’s at least 25 percent higher than normal. From the city ordinance that passed yesterday. Note that people who speed through each of the camera locations will have one month of warnings before real citations go into effect. 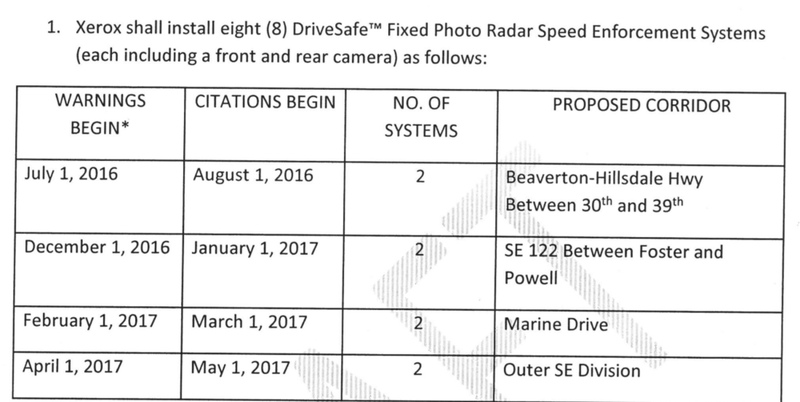 This push for fixed photo radar cameras (which the City has smartly begun referring to as “safety cameras”) began well over three years ago when the Bicycle Transportation Alliance and other advocates started talking to state legislators about the idea. 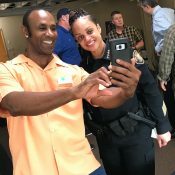 State law needed to be changed because the old law allowed cameras to be used only if a police officer was present and only if it moved around every few hours. 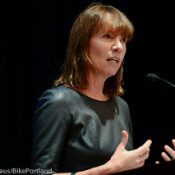 By 2015 the City of Portland made the speed camera issue a top legislative priority and the Oregon Legislature ultimately passed House Bill 2621 and Oregon Governor Kate Brown signed it into law in July. The City of Portland currently manages 11 red light cameras. A report by the City Auditor last summer showed that those cameras are doing their job; but there are some key issues worth noting as we enter this new era of photo-enabled enforcement. One thing to watch is how this new program will be administered. For camera operations and citations to go smoothly, PBOT, the Portland Police Bureau, Multnomah County (traffic court), and Xerox (who will remain as owner of the cameras according to the memorandum of understanding) will all have to coordinate their systems and efforts. If there are weak links in the chain of processing citations, some of the tickets could be dismissed. In the City of Denver a report found that as many as one in three citations don’t hold up in court for a variety of reasons. But let’s take a step back: This is great news! PBOT, Transportation Commissioner Steve Novick, the BTA, Oregon Walks (whose leader Noel Mickelberry testified at City Council yesterday), and all the other groups and individuals who changed the law and pushed for this program deserve a big high-five. The speeding epidemic won’t end overnight, but these cameras are a very big step forward in changing cultural norms around driving. And like we reported back in March, they just might allow us to finally flip the script on the scofflaw narrative. I hope as part of this the PPB will start ticketing drivers who install license plate covers to try to beat the cameras. There’s no legitimate purpose for those–doubly so for the tinted ones. Granted it isn’t enforced from what I can see. Might take a gander at ORS 803.550 – Illegal Alteration or Display of Plates. Don’t forget the Oregon motorists who don’t install their front license plate. OK, it’s nine months, which would mean that 16 additional cameras would take only *four* more years. But still! That’s a long time! good point. we can do a follow up story that looks more into why there’s such a lag in implementation. my hunch is – as I alluded to in the story – they want to make sure the admin protocols are very solid. They know that if they mess up the media is just waiting to pounce on it and that could jeopardize future efforts. because politics. Hm – reading the article again, it looks like I counted wrong – they’re installing eight cameras (one in each direction) in the current phase, so it would only be a year and change additional to install the other twelve. I guess what I’m still impatient about is that ten intersections in the whole city of Portland is far too little (because people will learn where they are and slow down there rather than changing their driving behavior overall). But as you point out, the politics is hard – if they end up a net cost, they’re “failed” (rather than media just accepting the cost for increased safety); even if they successfully cite and fine people, they could be lambasted as a cash cow rather than a legitimate safety measure. But, if these ten are successful, we can go to the Legislature and ask for speed cameras to be approved for wherever a city wants to put them. Also, nobody will get a ticket until they exceed the posted speed by 11mph, which is our whole problem. Or, do we not consider it a “speed-related” crash until speed was 11mph over? Allowing 30 in a 20, even 40 in a 30 undermines any effort of engineering — numbers mean things! We have red light cameras, so just put up red lights every 300ft and always give a red to speeding traffic. This might be annoying to everyone stuck behind the buckets of cluelessness speeding to stop like in downtown, but it is effective at controlling speeds. Hillsdale Neighborhood asked for the safety cameras to be east of 30th, where school kids are crossing and posted speeds are lower. With the 11mph “gimme”, I’m not sure that would help. Design speed is typically 10 mph faster than the posted speed. Guess we better post it at 10mph because impact and survival at 20mph is vastly different from 30. Why not just stick to the numbers on the signs? Great news. Will the revenues generated from the cameras go directly into a fund to be used exclusively for further safety improvements? If not, they should be. Are you kidding? The fund will go directly into the PERS fund. Why not lower the speed limit on BH Highway from 40 mph to 35 mph between Robert Grey Middle School and the Washington County line at SW 65th Ave? It is 35 in Raleigh Hills. Something needs to be done about Marine Drive. The gaps in the MUP network there are unacceptable, giving the average speeds and amount of truck traffic. Why can’t they just shift the two lanes south and install a Jersey barrier, making space for an 8ft MUP on the north side, for the sections that do not have an off-street MUP? East of 112th the pavement is 43 feet wide. It is a truck route posted 35+ mph, so 12-foot car lanes (distributed between travel space and wide center space with rumble strip), leaving 19 feet. For that posted speed, six foot shoulders help provide a break-down space away from moving traffic, as well as recovery space for roadway departure recovery. Which leaves seven feet. You want a jersey barrier? it’s base is 18 inches, so you might have five feet left over for your 2-way MUP. You could gain some space by lowering the speed limit, but not enough to get to your vision. West of 122nd the pavement is only 36 feet wide. It seems like we’ve prioritized breakdown shoulders over changes that would prevent cars from ending up in the river every few months. The roadway would need to be widened a bit, but the speed should be lowered to 30mph, which would permit 11ft lanes. I’m tired of getting passed by heavy trucks going 50mph with only 1-2ft of buffer. 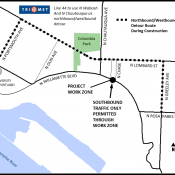 PBOT has funding to add buffered bike lanes to fill the gap east of I-205. Unfortunately there’s not enough right-of-way for multi-use path. As far as I can tell there is no 20 camera limit in the bill. Where does this limit come from and is it really binding? Moreover, it is my understanding that PBOT is planning on expanding the number of high crash corridors so it seemt to me that this bill would likely apply to additional locations in the near future. I took that from past BikePortland reporting, ( http://bikeportland.org/2015/06/12/city-engaged-battle-speeding-epidemic-144336 ) but you’re right, I don’t see anything in the bill stipulating one camera per corridor, nor is the definition of a high crash corridor particularly limiting. and what of the people going more than 20 over? no fines? or more severe punishment? I heard this stated once (but have no source to confirm it — so take it with a fat grain of salt) that the original “grace” speed was 10% over the speed limit for margin of error. That is, if you were going more than 10% over, there was no debating that you were speeding. Somewhere along the line, that got translated into 10mph over the speed limit – which is a much higher difference (27.5mph vs 35mph for a 25mph zone)! I’ve nearly never (exceedingly rare) have heard of someone getting a ticket for exceeding the speed limit by less than 10mph. I’ve mentioned this here before; the original X-band radar systems were given a 10% tolerance by the court system after legal challenges, and the guns had to be recalibrated every so often and carry a date stamp sticker (that you could ask the officer to show you if pulled over). That was a long time ago though… I originally read about it in a book on how to get out of speeding tickets, and as a younger (more foolish) man had plenty of opportunity to verify those techniques. have you considered running for office? If the policy makers are the problem, why can’t they be removed? Most worthwhile things are not easy. The only thing worse than trying and failing is not trying at all. Bitching about the way things are on a blog is somewhere in between, but definitely near the not trying end of the spectrum. This is pretty neat! Amazing how far tech has come! This might be long. I accept that we need photo speeding cameras, they do work in getting better speed compliance. BUT what would also work is reducing posted speeds. State not City controls local speeds much more than they should, and that is a problem. As for Photo cameras, if you read the ordinance, you will see that Xerox (formerly ACS- the collections company) gets paid FIRST and then if there is money after that it goes to city. So Xerox has a direct financial incentive to issue as many tickets as possible. My understanding from prior litigation is that the pay period is monthly, so every month Xerox wants to issue enough tickets to get themselves paid, and enough extra to give city some and help city justify the cameras as revenue generating. From an incredibly over technical stand point, please also note that the chain of custody of the photos is not very good. When they were ACS they did not, in my opinion, do all the correct cleaning, maintenance and record keeping on their camera, and I doubt that has changed. My understanding is that come Police officer gets and emailed copy of a citation, they review it and electronically sign it, then it gets mailed the defendant. The police don’t have the pictures, they don’t actually know when they were taken, they are trusting the outside vendor’s camera and computer when PPB have no actual control of those systems. Less speeding is needed, I don’t love vendor driven cameras. If they are such a great deal why can’t city do it themselves and keep the very first dollar? speed will improve traffic safety on their street or in their community. On the other hand, speed zones that are unrealistic are often disregarded by a majority of motorists who are normally careful and law-abiding drivers. Citizens who believe that lowering speed limits will improve safety are just being…emotional. That’s so classically out of touch I don’t know where to begin. Just what world does ODOT live on? It’s certainly not this one where I can watch any vehicle for two blocks and see a violation of the law. Can you provide a citation or reference for your belief that can be independently verified? Name a street we can look up. Well, you’re welcome to come squat at my corner and observe our purported surfeit of ‘law-abiding drivers.’ Right now would be a nifty time (it’s 4:27pm). Or feel free to pop over to Powell. You could also come and sit outside our office on Upper Boones Ferry; I can count with one hand the number of cars who will be going the 35mph posted speed limit, but I will run out of hands and feet in counting the number going more than 10mph over. Upper Boones is a state highway, too, so it’s 100% ODOT’s jurisdiction. 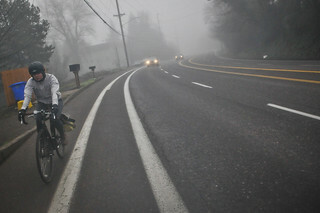 You can also sit on Hall Blvd anywhere in Tigard and count the many, many people who speed. That’s also a state highway. ODOT may in some instances, be way to liberal in posting the 40 and 45 mph speed to some roads and highways in the metro area. Rick’s comment here, refers to what I think may be one such example, Beaverton Hillsdale Hwy. From Raleigh Hills to Hillsdale, is not such a great distance…it’s about three miles. There’s no truly good argument for having people drive 45 mph on this road. It should be 30, tops, at least during daytime hours and early evening when lots of people with their vehicles, are on the road using it. I won’t continue here, naming other segments of roads I think are similarly over-posted, but do feel there may be a bunch of them in that category. I’m glad for the increase in use of photo radar speed reduction cameras. People driving excessively fast on area roads, I think, has a terrifically negative effect on people’s stress levels. That’s an insidious effect, I think. People can and do get used to all kinds of very negative things happening. Doesn’t mean, because various rationale have been assembled to justify perpetuating the bad stuff, that people should keep on accepting it. The 10-11 mph over speed limit prompting citation, is too much latitude. I’d go for 6 over. In other words, you’re not cited for going 5 mph over the speed limit…but 6 mph and you’re nicked. Somebody here suggested an over 3 mph prompting citations…I think this would be too tight. Got to allow people some variance for keeping their vehicle within posted speed and the latitude allowed. Not everyone’s vehicle is equipped with settable cruse control. So, lower the posted speeds–and then get the city’s attorneys to work figuring out how to get away with stiffing the camera company. Remind me to never sign a contract with you. Life over the law, babycakes. I was hoping someone with legal experience would weigh in on this, thanks Mark. Most of what I’ve read about red light cameras – which are being decommissioned all over the bay area as I write this – has to do with the success rate of the legal challenges. The comments that these articles generate is also telling, and there are many organizations fighting them on the grounds that you describe. It seems like automated enforcement is just plain travesty for the multitude of “normally careful and law-abiding drivers”… like they’re somehow being tricked. (I’ve read argument after argument about yellow light timing from drivers who were ticketed for turning right on red lights without first stopping). I assume photo radar will suffer the same legal challenges in practice. Oregon has had it for years. Beaverton got into trouble for something, but Portland has not been challenged, or at least lost, regarding the right to use the devices. Mark will also recall that I was one of the people tagged by the existing photo radar system on Beaverton-Hillsdale. I was definitely NOT speeding. I was being passed by another car going at least 10 MPH faster than me. The photo radar recorded 3 photos of me; 1 with the passing car behind, one even and the 3rd with that car ahead. Basically I got tagged because the other guy was speeding. I have no idea if that guy was ticketed as the police would not release information in other tickets issued at the time of mine. I went to traffic court with Mark and 2 witnesses that had been in my car at the time. The police officer misrepresented the facts in his testimony indicating 1) that clearly speeding by his visual estimate and 2) that if 2 cars were in the photo radar no picture would be taken. The judge ignored the clear presence of 2 cars in the photos and claimed that photos did not demonstrate that I was being passed by the other car. I drive this segment of Beaverton-Hillsdale at least weekly. I still am wondering what I will do the next time I drive past the camera and see the flash go off when I am going at the speed limit or less. I fully in favor of more aggressive enforcement of speed limits. I drive the speed limit. I am constantly being passed like I am standing still. I am not, however, convinced that photo radar is a dependable tool to identify speeders given my experience. I suspect that they are a whole lot more effective as revenue generating devices. The court experience soured me on the whole subject of the court system. I am only glad that I was not there accused of a more serious offense as I doubt that the process would be any more accurate. I also want to thank Kim Stone of Oregon and SW Washington Families For Safe Streets for her very first time testifying. Her son was killed at the intersection of Division and 156th. I believe cameras will be installed very near there. I testified before the Legislature in 2015. They were quite concerned about the warnings, that drivers had to be 11+ over the limit, that this was not about revenue. I agree that 11 over is ridiculous but this is at least a start. And the goal is to get them to slow down, not ticket them. I thank PBOT especially because I know staff worked very hard on this. I know they care. Why fixed locations. It will only take a day and everyone will know where they are. Put them on mobile speed carts and move them around every few days. Portland has used mobile photo radar before. I know because I got a hefty ticket from one, on my very first day in town, long ago. I agree, mobile units make sense. They still have them, but there are strict restrictions on their use. Fixed photo radar is limited to high crash corridors – locations that have a pattern of crashes needing a more holistic effort than just random patrols (that require personnel PPB doesn’t currently have). Also, existence of a pole and box does not equal a camera, but probably will. an emerging technology from other countries is the point to point photo radar. Like the tickets received for speeding on tollways, it tracks entry and exit from a corridor and calculates your speed along the corridor, so could affect a greater area than single point cameras. Current law does not describe this use, so it does not expressly prohibit it. With the NSA’s help. we can install enough cameras that every inch of road is monitored. We then lower the speed limit on all roads to 20 mph – after all, no one dies at that speed. Jail every speeder. In the meantime, you guys can have your shriveled testicles surgically removed, and can exchange them for $ 50 coupons at most naturopathic incense shops. Remember–the word “automobile” appears NOWHERE in the US Constitution. Neither does the word “bicycle”. And bikes don’t kill 30K+ people a year either. Is it that hard to drive under the speed limit? “Hard”, like “pedal up a hill” hard? No, all it requires is the ability to read a two-digit number on a roadside sign and match it to the little gauge on the instrument panel of EVERY AUTOMOBILE THAT MOST OF US WILL EVER DRIVE OR RIDE IN. Nice idea but watch the # of illegal license plate covers explode. Not to mention the folks who just put clear reflective stickers over theirs, harder to see at a glance but still effective with photo radar. Am I the only one who recognizes that speed limits and driving habits CAN and SHOULD be different under different conditions? Night, dark, heavy rain – speed limit lower; daytime, good visibility, good weather – speed limit higher. Rush hour, hundreds of cars passing every minute – lower speed; light traffic, only a few cars per minute – higher speed. Traffic volume measuring devices are widespread. 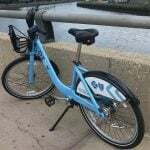 If we can put sensors on Barbur to detect bicyclists and flash lights to warn drivers of BICYCLE ON BRIDGE, we can have variable “reasonable and prudent” speed limits. Setting speed limits artificially low – the worst possible conditions limit – is a tool for revenue generation, not safety. Arizona (and other places) have different limits for day and night. Google finds photos of signs that say SPEED LIMIT 45 and NIGHT 40, or SPEED LIMIT 80 and NIGHT 65. They use special paint so the day limit is very hard to read at night. We’re just a few days away from the scheduled start date for the speed radar system on BHH. Has anyone noticed if it’s already been installed? The cops can’t be everywhere. The cameras are a great tool, just like speed-limit signs are a tool. The real control lies in the competency of the drivers and the bike riders. Share the road and be nice. « What’s it like to ride around Tophill Trestle on the Banks-Vernonia Trail?